February 7, 1930: “The Hollywood Starlets Trio” (Judy and her sisters) performed at a PTA Benefit at the Burbank High School, Burbank, California. 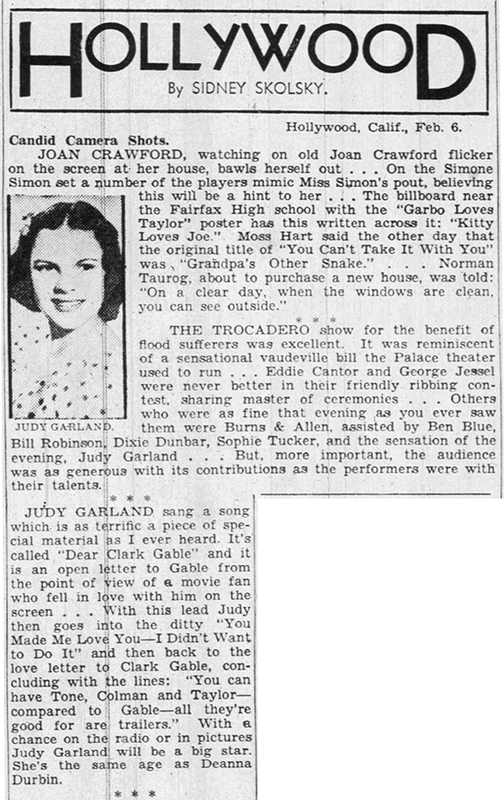 February 7, 1937: Sidney Skolsky’s column noted that Judy had recently performed “Dear Mr. Gable” (Skolskly incorrectly called it “Dear Clark Gable”) at the Trocadero nightclub in Hollywood. Skolsky’s column was dated the 5th and the 6th and published in various papers on the 6th & 7th. This means Judy’s performance at the Trocadero was most likely on the 4th, perhaps a day or two earlier. 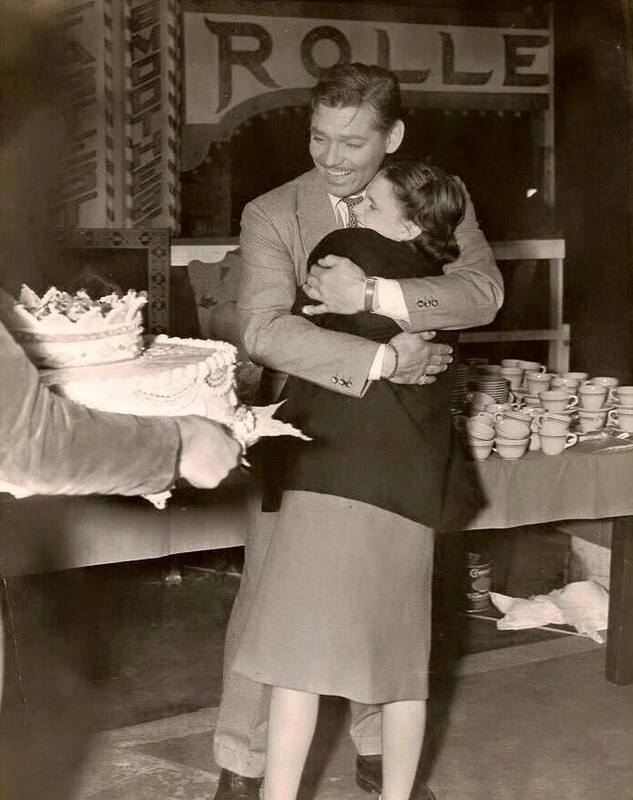 Judy premiered the song at MGM’s party for Clark Gable’s thirty-sixth birthday, held on the set of his film Parnell on February 1st. 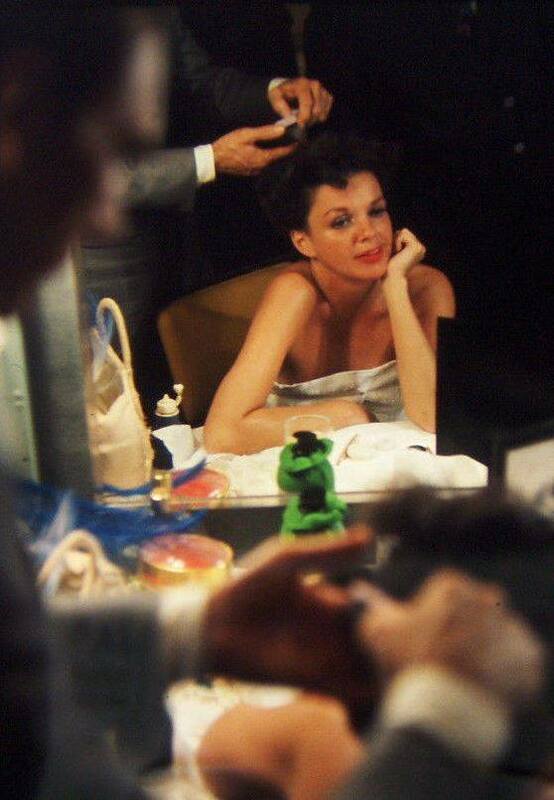 Her performance at the party was so successful that MGM wasted no time in promoting Judy and the song. At this point, the song had some different specialty lyrics (provided by Roger Edens) that were industry-centric and poked gentle fun at a recent issue with a crazy fan making claims against Gable in letters that began “Dear Mr. Gable.” The lyrics that we now know were added at some point before Judy’s rendition of the song at an MGM dinner/dance on February 22nd. The new lyrics may or may not have been in place for this Trocadero performance. It could be that the inside joke was kept intact for the Trocadero show being that everyone in the audience would have been in the know. This was Judy’s first “identifier song” and although most people in Hollywood knew of her and her talents this song and her subsequent performances on stage and radio was a major influence on the upward trajectory of her career. 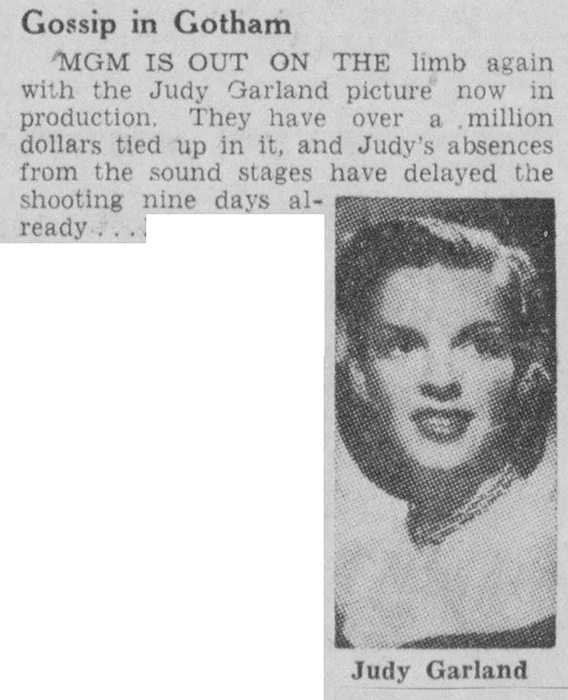 The song was added to Judy’s upcoming appearance in Broadway Melody of 1938, pre-recorded on May 7, 1937. 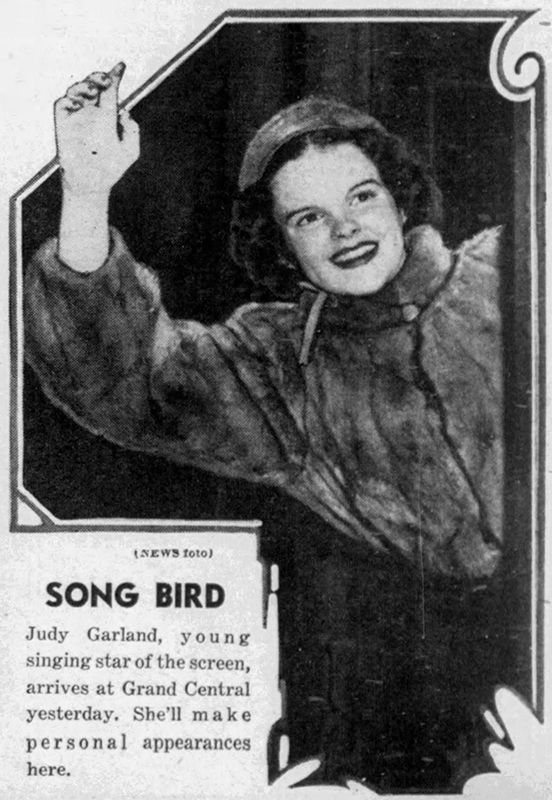 February 7, 1938: Judy arrived in New York City for her first appearance on a New York stage, at Loew’s State in support on Everybody Sing, on February 10, 1938. 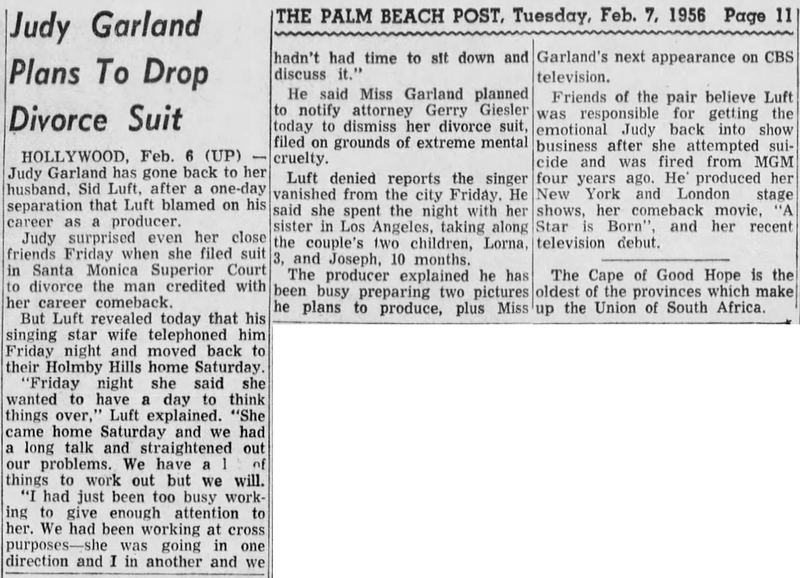 The clipping above was published on February 8th, the day after Judy’s arrival. February 7, 1940: Beauty columnist Helen Follett again used Judy as an example of a pretty young girl, this time with healthy cheeks thanks for her outdoor exercise. It’s ironic that while at MGM Judy felt like a “plain Jane” (and the studio sometimes callously fostered that feeling) yet in many ads and columns she was presented as the epitome of the pretty young American girl. 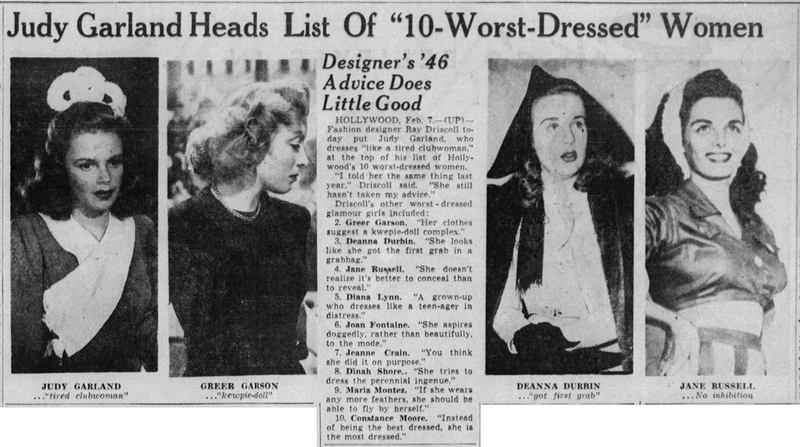 February 7, 1941: Judy took a short vacation to Palm Springs, California, accompanied by her mother and, according to this article, a person by the name of Betty Graham (perhaps her secretary). 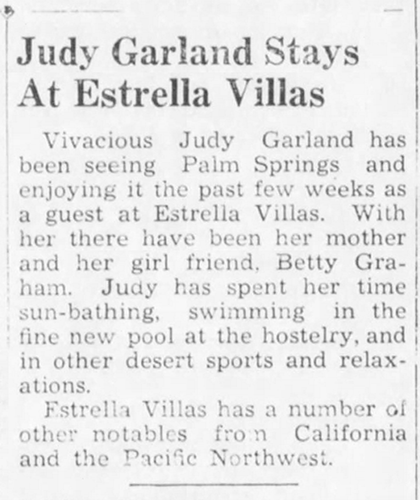 The article notes that Judy had been staying at the Estrella Villas “for the past few weeks” and if true, then he must have gone back to Los Angeles for one day/evening for the radio broadcast of “Love’s New Sweet Song” on the CBS “Silver Theater” program on January 26, 1941. 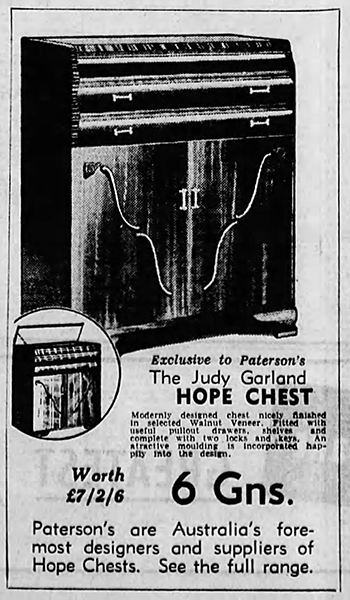 Also above is an ad from “The Age in Melbourne, Victoria, Australia, for the “Judy Garland Hope Chest.” The chest must have been popular as it was sold in store across the U.S. as well. 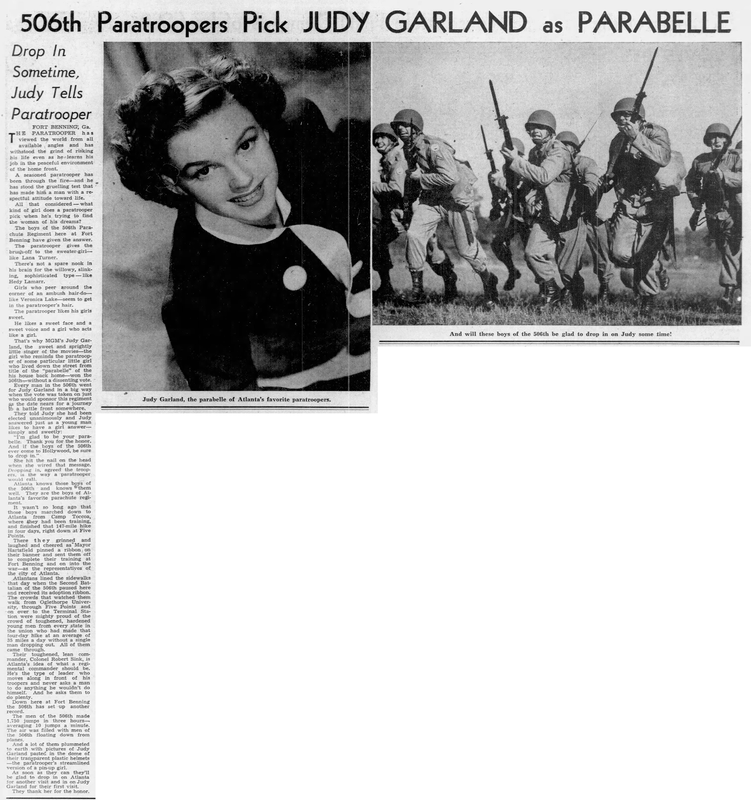 February 7, 1943: The 506th Paratroopers in Fort Benning, Georgia, named Judy as their “Parabelle.” Judy responded by telling them they could drop in on her at any time if they were to visit Hollywood. THE PARATROOPER has viewed the world from all available angles and has withstood the grind of risking his life even as he learns his job in the peaceful environment of the home front. A seasoned paratrooper has been through the fire – and he has stood the grueling test that has made him a man with a respectful attitude toward life. All that considered – what kind of girl does a paratrooper pick when he’s trying to find the woman of his dreams? The boys of the 506th Parachute Regiment here at Fort Benning have given the answer. The paratrooper gives the brush-off to the sweater girl – like Lana Turner. There’s not a spare nook in this brain for the willowy, slinking, sophisticated type – like Hedy Lamarr. Girls who peer around the corner of an ambush hair-so – like Veronica Lake – seem to get in the paratrooper’s hair. The paratrooper likes his girls sweet. He likes a sweet face and a sweet voice and a girl who acts like a girl. 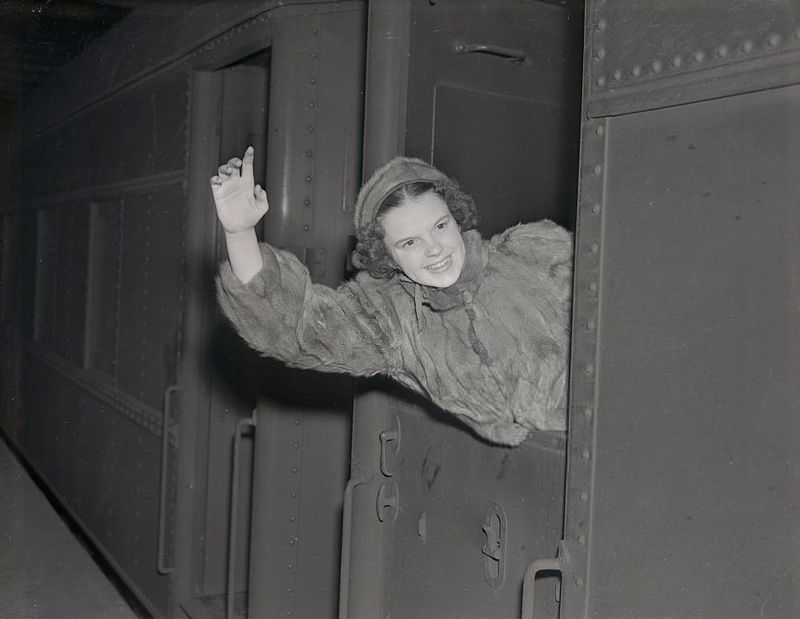 That’s why MGM’s Judy Garland, the sweet and sprightly little singer of the movies – the girl who reminds the paratrooper of some particular little girl who lived down the street from title of the “parabelle” of the [sic] his house back home – won the 506th – without a dissenting vote. Every man in the 506th went for Judy Garland in a big way when the vote was taken on just who would sponsor this regiment as the date nears for a journey to a battlefront somewhere. She hit the nail on the head when she wired that message. Dropping in, agreed the troopers, is the way a paratrooper would call. Atlanta knows those boys of the 506th and knows them well. They are the boys of Atlanta’s favorite parachute regiment. It wasn’t so long ago that those boys marched down to Atlanta from Camp Toccoa, where they had been training, and finished that 147-mile hike in four days, right down at Five Points. There they grinned and laughed and cheered as Mayor Hartsfield pinned a ribbon on their banner and sent them off to complete their training at Fort Benning and on into the war – as the representative of the city of Atlanta. Atlantans lined the sidewalks that day when the Second Battalion of the 506th paused here and received its adoption ribbon. The crowds that watched them walk from Oglethorpe University, through Five Points and on over to the Terminal Station were mighty proud of the crowd of toughened, hardened young men from every state in the union who had made that four-day hike at an average of 35 miles a day without a single man dropping out. All of them came through. Their toughened, lean commander, Colonel Robert Sink, is Atlanta’s idea of what a regimental commander should be. He’s the type of leader who moves along in front of his troopers and never asks a man to do anything he wouldn’t do himself. And he asks them to do plenty. Down here at Fort Benning the 506th has set up another record. The men of the 506th made 1,750 jumps in three hours – averaging 10 jumps a minute. The air was filled with men from the 506th floating down from planes. And a lot of them plummeted to earth with pictures of Judy Garland pasted in the dome of their transparent plastic helmets – the paratrooper’s streamlined version of a pin-up girl. As soon as they can they’ll be glad to drop in on Atlanta for another visit and in on Judy Garland for their first visit. They thank her for the honor. February 7, 1945: Judy had rehearsals for The Harvey Girls, specifically the “Swing Your Partner Round and Round” and “Picnic sequence” numbers. 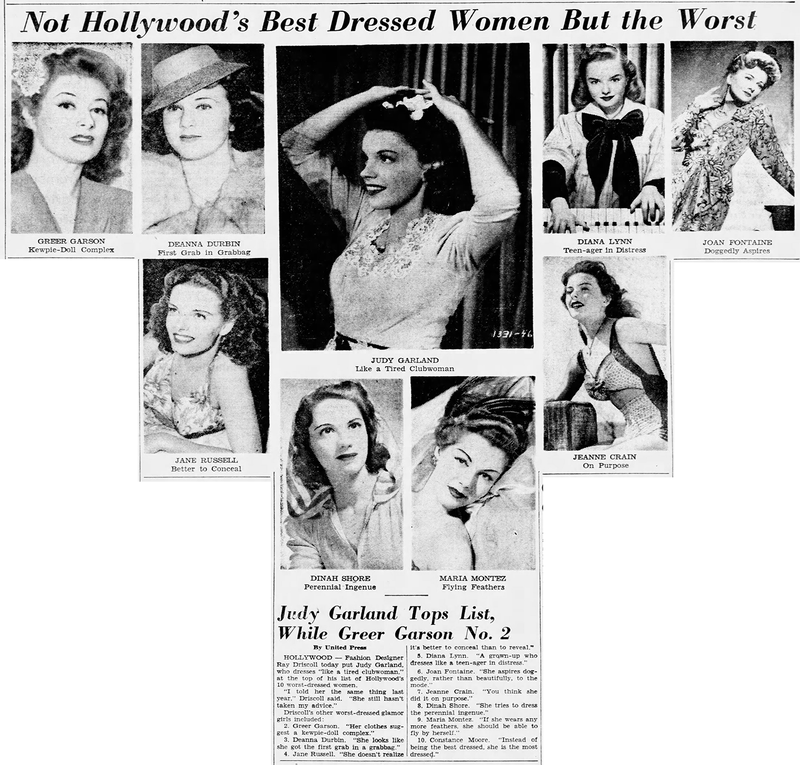 Time called: 10 a.m.; Judy arrived on the set at 2:00 p.m.; dismissed: 5:00 p.m.
February 7, 1947: Poor Judy. She was listed as the “worst dressed” in Hollywood, for the second year! 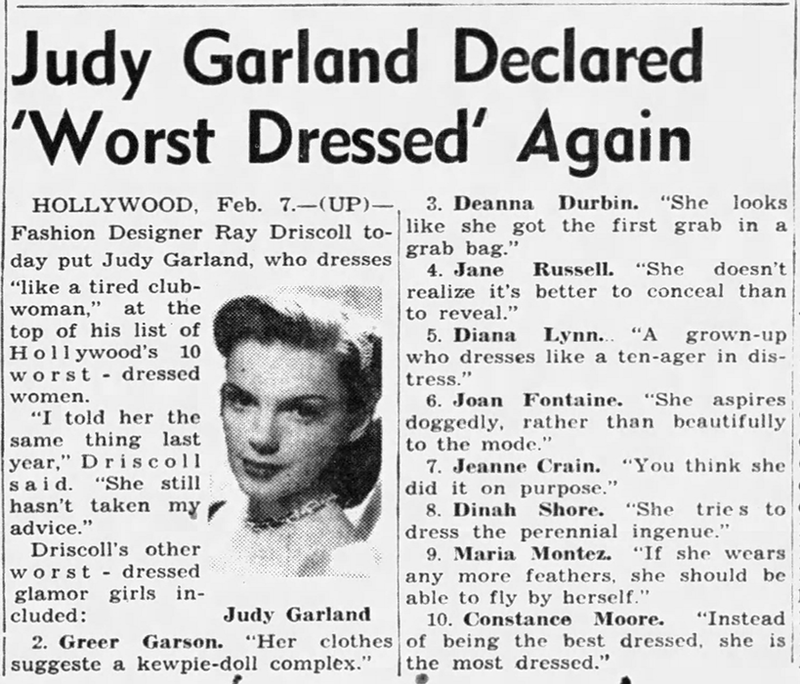 Fashion Designer Ray Driscoll today put Judy Garland, who dresses “like a tired club-woman,” at the top of his list of Hollywood’s 10 worst-dressed women. Meanwhile, Till The Clouds Roll By was a huge hit, with Judy playing the glamorous star Marilyn Miller, and looking quite like a glamorous (and beautiful) leading lady herself, in spite of what Mr. Driscoll’s opinions! 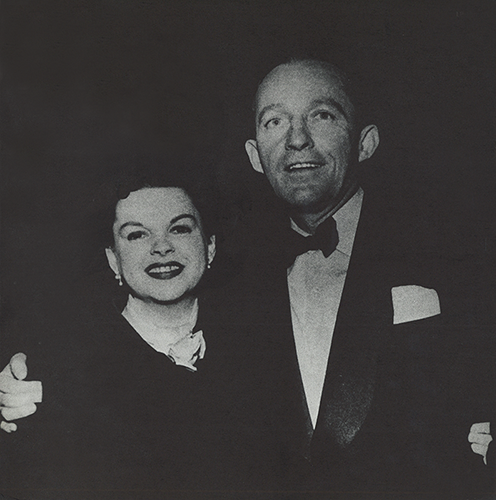 February 7, 1948: Judy had no call and was not needed for any work on Easter Parade. She had not worked on the film since February 3rd. 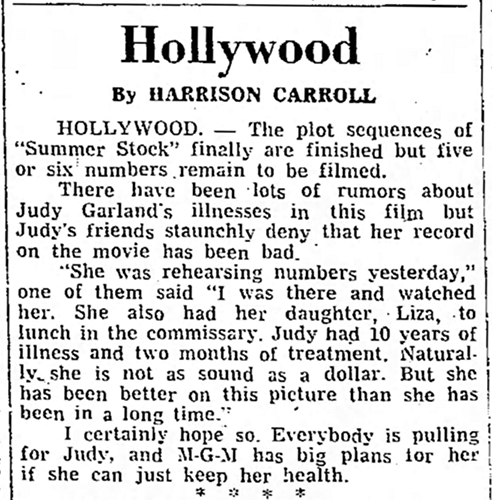 On the 4th and 5th, she had no calls for work on the film, on the 6th she was out sick. She returned to the production on February 9th. 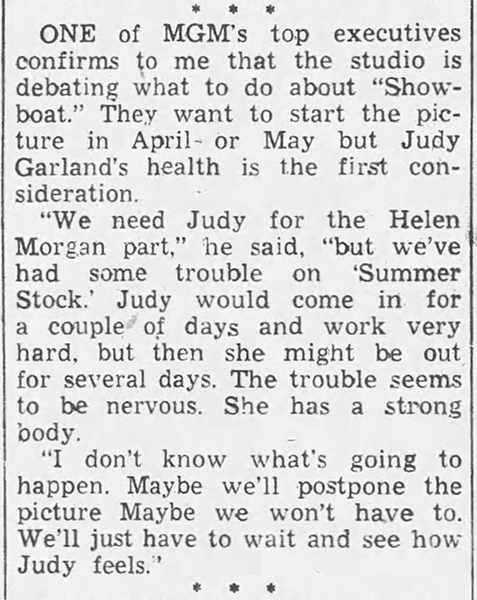 February 7, 1950: Judy’s recent troubles at MGM and the production of Summer Stock was the talk of the columnists. 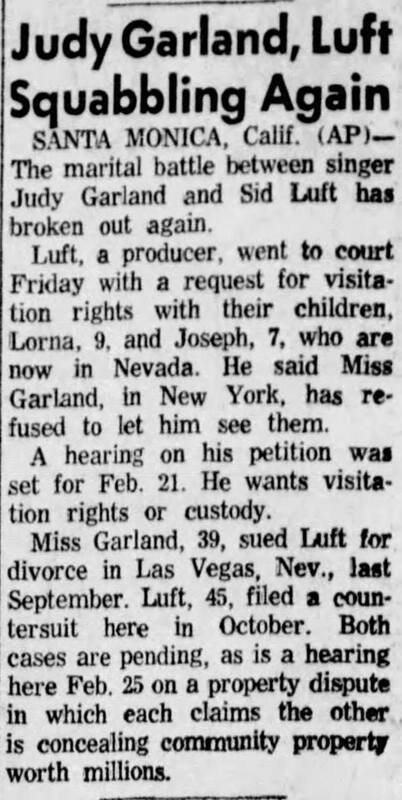 The first two are from Harrison Carroll’s column (two separate columns printed on the same day), the third is from Dorothy Kilgallen, the fourth is uncredited. 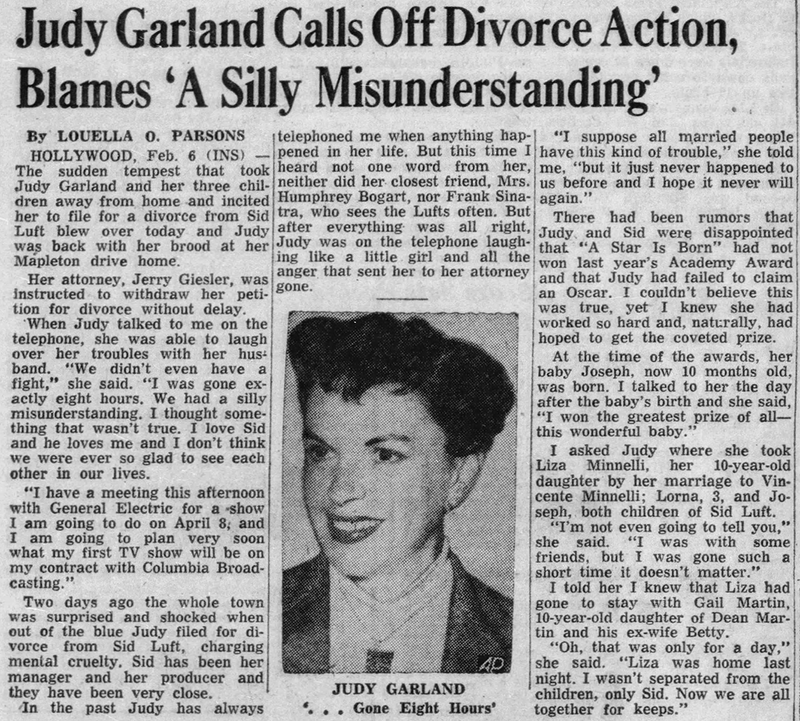 February 7, 1951: Judy tells her own story. On Sunday. 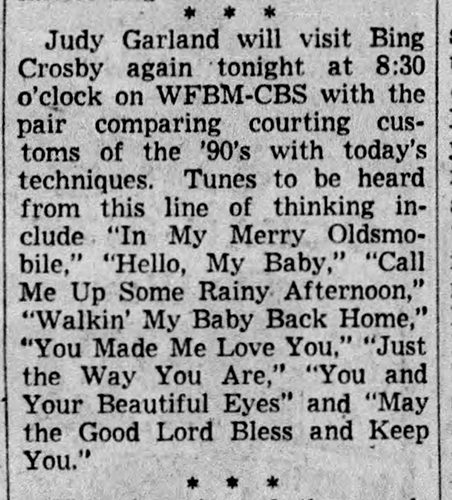 February 7, 1951: CBS Radio broadcast Judy’s appearance on “The Bing Crosby Show.” Crosby recorded all of his shows in advance and this was no different, having been recorded on January 23, 1951. The recording survives and has been released on various LPs and CDs. 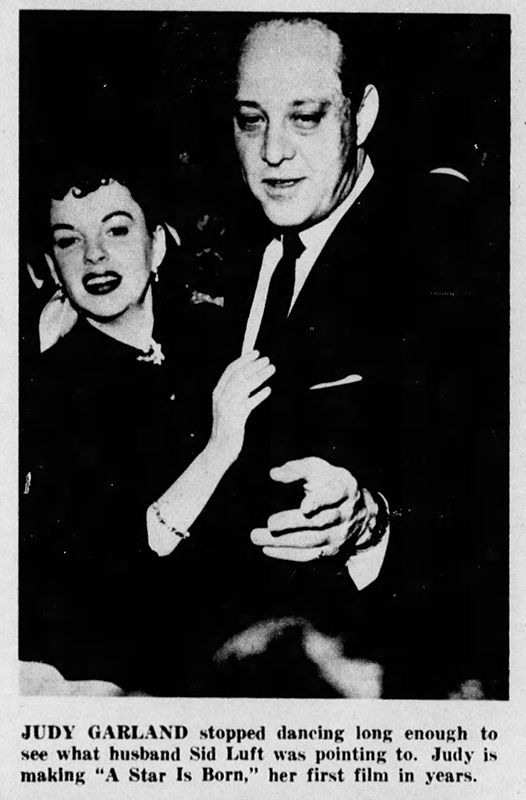 February 7, 1954: Judy and husband Sid Luft were recently seen on the town, as shown in this photo from Nat Dillinger’s “Inside Hollywood” photo column. 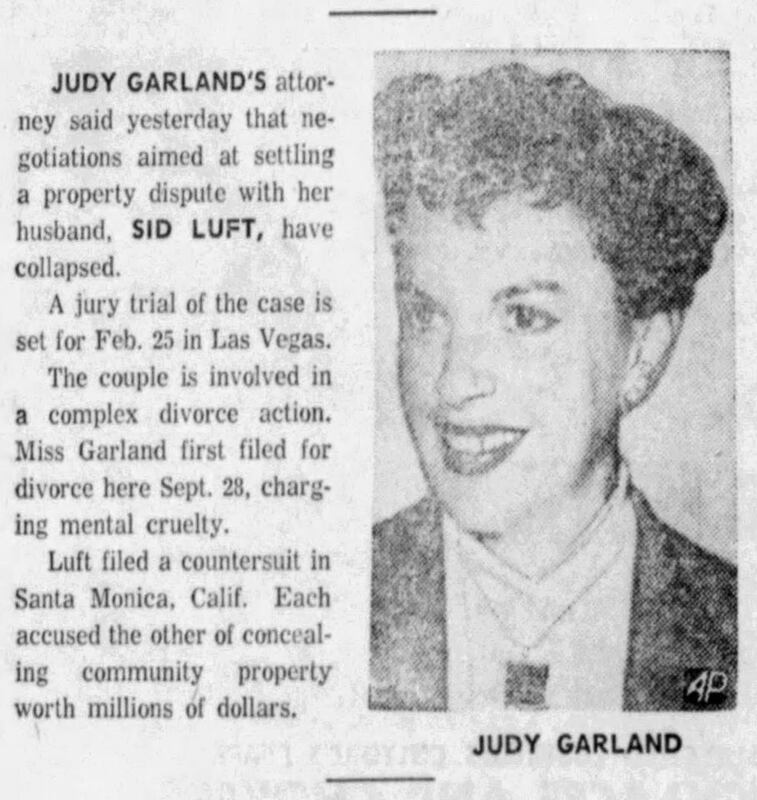 February 7, 1956: Judy dropped her divorce from Sid Luft. She had filed for divorce on February 3, 1956. 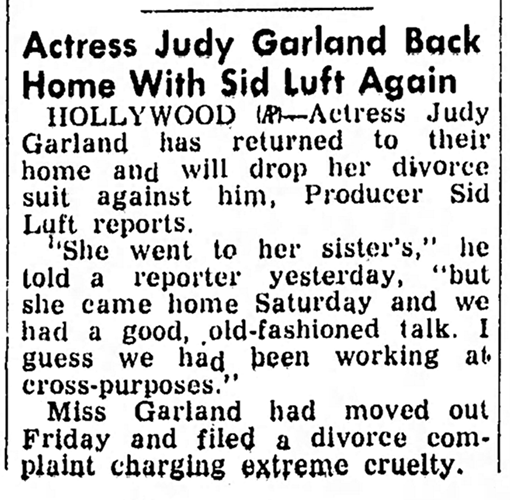 It was the first time Judy filed for divorce from Sid. It wasn’t the last. The couple’s divorcing, separations, and reconciliations were fodder for the news columnists and gossips for years to come (see below). 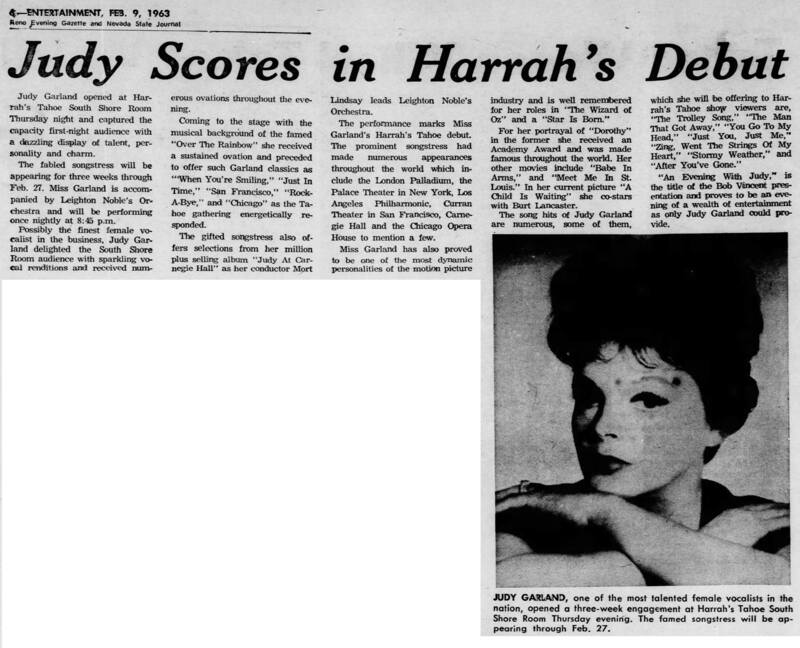 February 7, 1963: Judy appeared at Harrah’s Resort in Lake Tahoe. 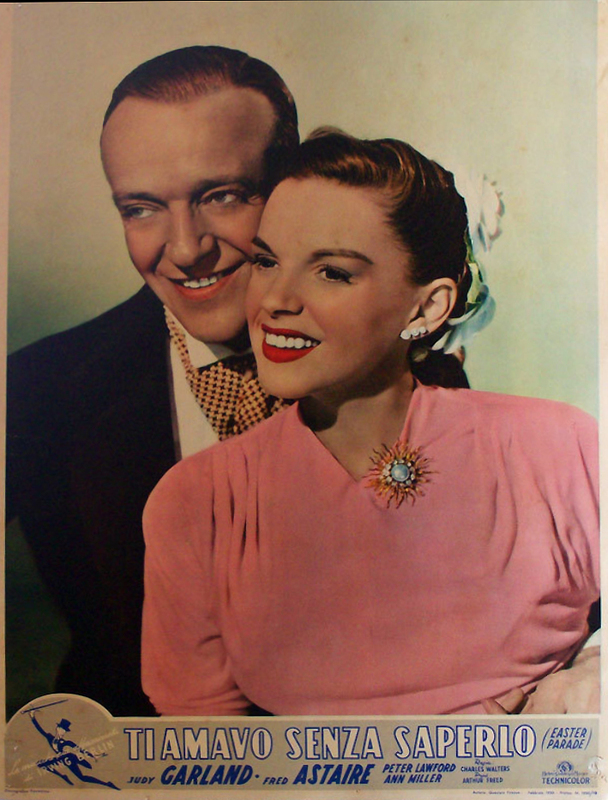 She opened her scheduled three-week engagement of her mini-concert (one hour) with the following songs: “Hello, Bluebird”; “Almost Like Being In Love”/”This Can’t Be Love”; “Do It Again”; “Never Will I Marry”; “As Long As He Needs Me”; “Judy’s Olio”; “By Myself”; “Rock-A-Bye Your Baby”; “San Francisco”; and her debut performance of “As Long As He Needs Me” (although this song is not listed in the opening night rundown. Mort Lindsey conducted. Judy came down with the flu just a few days later on the 11th but rallied to perform on the 12th. She then collapsed just before going on stage on the 13th. On the 14th, she was taken by ambulance to a hospital in Carson City, Nevada. By the afternoon, she paid a visit to the hospital administrator saying she was fine and returned to Tahoe for a “quiet Valentine’s Day party” with her children. The hospital had to hire extra staff to handle the flood of calls from her fans and the media. 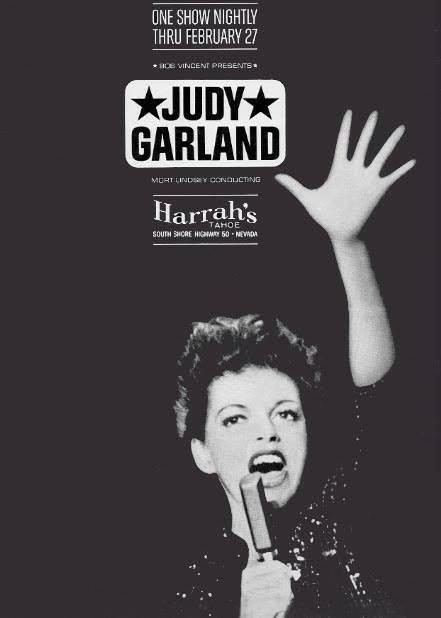 On the 15th, and although Judy announced she was feeling better, the Harrah’s management allowed her out of her contract. She was suffering from complete exhaustion. Pal Mickey Rooney was called in to replace her for the rest of the engagement. 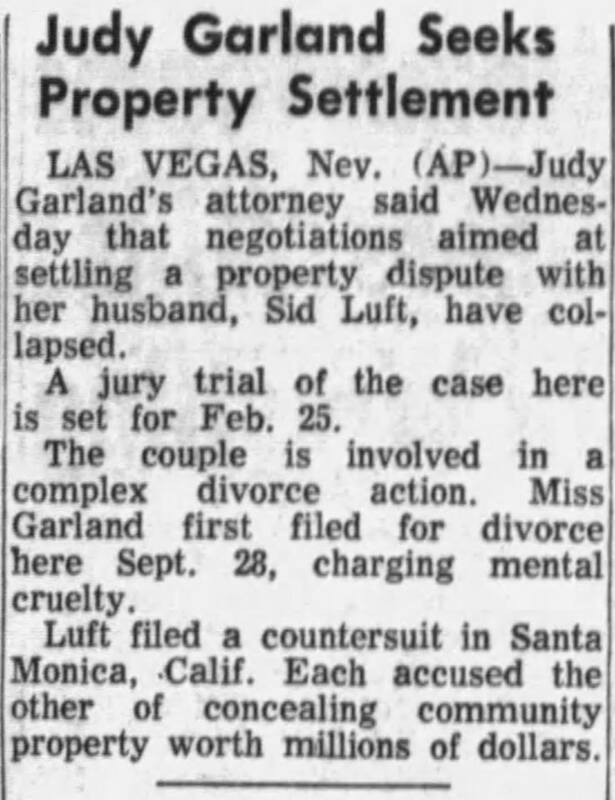 On the 16th, Judy stayed in Tahoe with husband Sid Luft whom she had just reconciled with. 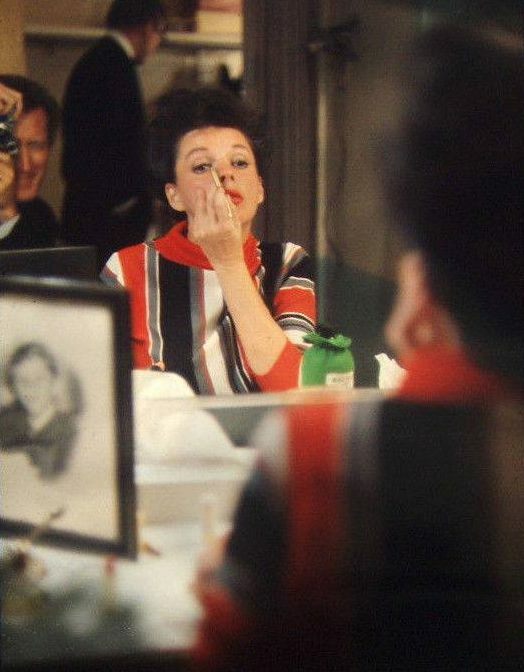 Photos: Judy backstage plus ads, articles, and review of Judy’s appearance; Judy backstage. 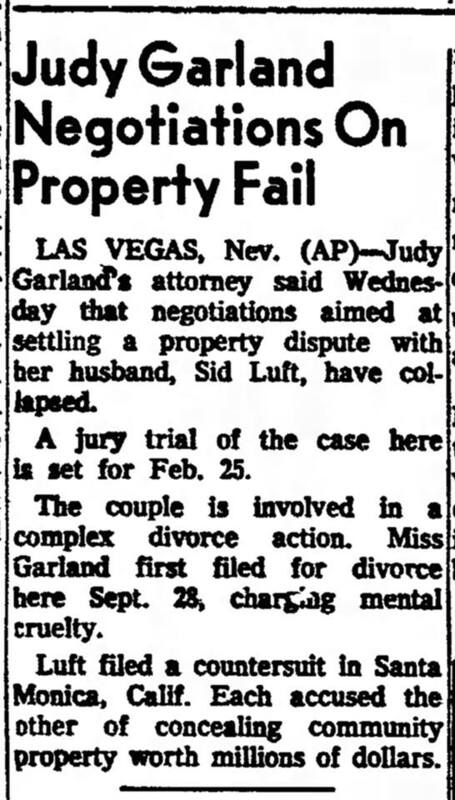 February 7, 1963: The latest divorce drama between Judy and husband Sid Luft continued to play out in the newspapers over several days as it did from time to time. February 7, 1965: Judy gave a press conference in Toronto, saying “My ambition is to be a good cook, a good mother, do a good show, and have some fun.” Her favorite film was mentioned as The Wizard of Oz, her favorite singers were mentioned as Tony Bennett and Peggy Lee. Judy had dinner that evening with Mark Herron and Peter and Chris Allen, in the hotel’s Victoria Room (the King Edward Sheraton Hotel), from 9:15 p.m. to 10:05 p.m.
Judy was always known for having poor taste in clothes. If you look at candid photos of her from the late ’30’s onward, she is shown wearing some bizarre outfits (in her films, or on her TV show, she, of course, is professionally attired). There’s one photo from “Life” magazine in 1943, where she is shown reaching for some canned goods in a supermarket. She is wearing a sort of red/or dark flannel top, a knee length skirt (that doesn’t match) and COWBOY boots! In 1953, she shows up for her “Lady in the Dark” radio broadcast wearing a GOLF hat (!). She also dressed like this for her TV show rehearsals. So true! I have always found it amusing how Judy had no real fashion sense. Of if she did, she didn’t care and wore whatever was comfortable! LOL I know the supermarket photo you’re talking about. That one was professionally done so I would blame whoever was in charge of that photo shoot and their “vision.” But normally, Judy was her own worst enemy in the fashion department. Garland also didn’t seem too interested in her hair when she wasn’t performing for the cameras. Many pictures of her doing radio shows show her wearing a turban or some other type of head gear.